The television news networks will be providing special coverage of the state funeral for the 41st President of the United States George H.W. Bush on Wednesday morning. The funeral —which will take place at the Washington National Cathedral— is scheduled to begin at 11 a.m. ET. 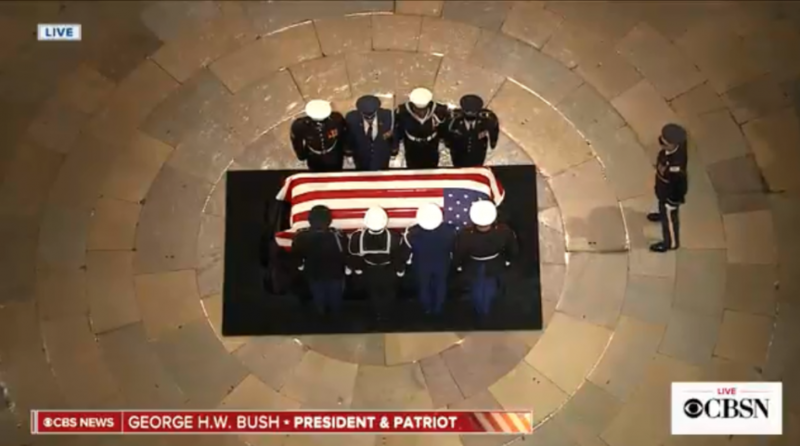 Network news broke into regularly scheduled programming with special reports on Monday, as the late president’s body traveled from Texas to Washington DC, arriving to lie in state in the U.S. Capitol Rotunda in the late afternoon. Cable news has been covering the life and legacy of the late president over the past couple of days, and will continue to do so through Wednesday. Chief anchor George Stephanopoulos will anchor special coverage of funeral and services from New York on Wednesday, beginning at 10 a.m. ET. Stephanopoulos will be joined by World News Tonight anchor David Muir from Washington, Good Morning America co-anchor Robin Roberts from New York, 20/20 co-anchor Amy Robach from Houston, senior national correspondent Terry Moran and senior congressional correspondent Mary Bruce from Washington, and political analyst Cokie Roberts and presidential historian Mark Updegrove from New York. ABC News Live — the network’s 24/7 breaking news and live events streaming channel — is offering live coverage all week starting Monday on Roku, Hulu, AppleTV, Amazon Fire TV, YouTube, Facebook, Twitter and the ABC News site and mobile phone apps. ABC News will also provide comprehensive coverage on ABCNews.com and GoodMorningAmerica.com. Daily newscast On Location will feature segments all week — exclusively on Facebook Watch. ABC News Radio coverage will be anchored by correspondent Aaron Katersky who will be joined by correspondents Karen Travers, Stephanie Ramos and Lana Zak in Washington, Jim Ryan in Houston and contributors Ann Compton, Steve Roberts and more. CBS This Morning co-hosts Norah O’Donnell, John Dickerson, Gayle King and Bianna Golodryga and CBS Evening News anchor Jeff Glor to lead CBS News coverage live from Washington, DC. Chief White House correspondent Major Garrett, CBS News chief legal correspondent Jan Crawford, CBS News political contributor Bob Schieffer, Congressional correspondent Ed O’Keefe at Joint Base Andrews, and a team of CBS News correspondents reporting from around the country will join O’Donnell, Glor, Dickerson, King and Golodryga during the coverage. Glor will deliver up-to-the-minute coverage from Washington on the CBS Evening News. CBSN will simulcast CBS News’ live funeral coverage. Newspath correspondent Nicole Killion will report from Washington, correspondent Mola Lenghi will report live from Houston. CBS News Radio will provide anchored coverage starting at 10 a.m. ET and continue throughout the duration of a Memorial Service at the National Cathedral and the departure ceremony at Joint Base Andrews. CBS News Radio will also provide special reports starting at 9:20 a.m. – 7:50 p.m. Correspondent Bill Rehkopf will anchor from Washington, DC and will be joined by and correspondent Steve Dorsey on Capitol Hill. Additionally, WCBS AM Reporter Rich Lamb and former White House Correspondent and CBS contributor Peter Maer will report from the National Cathedral, political consultant Prof. Leonard Steinhorn will contribute from Washington, and correspondent Steve Futterman will be in Houston. On Wednesday, December 5, Savannah Guthrie and Lester Holt will lead the network’s special coverage of the 41st president’s memorial service from Washington National Cathedral beginning at 9 a.m. ET. Morning Joe kicks off MSNBC’s coverage Wednesday morning. Brian Williams, host of The 11th Hour with Brian Williams, will lead MSNBC’s coverage of the service from the National Cathedral, joined by Chris Matthews, host of Hardball, and Nicolle Wallace, host of Deadline: White House. Jon Meacham, NBC News contributor and President George H.W. Bush biographer, will contribute to the network’s coverage throughout the week, as will NBC News contributors Andy Card and Michael Beschloss. NBC News contributor General Barry McCaffrey will be part of MSNBC’s coverage. NBC News and MSNBC will continue to cover the funeral service for President George H.W. Bush in Texas on Thursday. On Wednesday, Dec. 5th, Special Report’s Bret Baier and The Story’s Martha MacCallum will co-anchor special coverage of President Bush’s funeral at the Washington National Cathedral beginning at 9 a.m. ET. America’s Newsroom’s Bill Hemmer and The Daily Briefing’s Dana Perino will contribute live from outside the National Cathedral with Fox News Sunday’s Chris Wallace joining from DC. On Thursday, Dec. 6, chief news anchor Shepard Smith will anchor live coverage of the funeral in Houston at 11 a.m.
Smith will be joined by special guests, including FNC contributor Karl Rove, former deputy assistant to President George W. Bush, Brad Blakeman and former special assistant and speechwriter to then-Vice President George H.W. Bush, Clark Judge. Additional contributions to coverage throughout the week will be made by: Chief White House correspondent John Roberts and White House correspondent Kevin Corke; Chief Congressional correspondent Mike Emanuel from Washington National Cathedral; Washington correspondent Rich Edson from Freedom Plaza; Ellison Barber from Capitol Hill; Kristin Fisher from Joint Base Andrews in Maryland; Alicia Acuna and William La Jeunesse from the George H.W. Bush Presidential Library and Museum in College Station, TX. ; Rick Leventhal from Ellington Field; and Casey Stegall from St. Martin’s Church. Fox News Radio will also provide live reports for all radio affiliates on the memorial services beginning on Monday, December 3rd through Thursday, December 6th. Gurnal Scott, Jared Halpern, Jon Decker, Jeff Monosso and Tonya J. Powers will lead coverage which can be heard on www.FoxNewsRadio.com and Fox News Radio affiliates across the country. Additionally, Fox News Headlines 24/7 will provide updates every 15 minutes on SiriusXM Channel 115. In addition, FOXNews.com will feature up-to-the-minute coverage of the services. FOXNews.com will be live streaming memorial events, as well as feature reporting and in-depth analysis throughout the week. Fox Nation FNC’s new on demand streaming service which debuted last week, will also present a series of specials about President George H.W. Bush including, President George H.W. Bush: The Man And His Mission hosted by senior political analyst Brit Hume. The special will reflect on President Bush’s days as a fighter pilot, to peacefully ending the Cold War as the 41st President of the United States. Other specials hosted by Hume will include, Destiny and Power: The Private Diaries of George Herbert Walker Bush and A Bush Family Album, which will reflect on Bush’s extraordinary life of service. Additionally, Fox Nation will make of available a series of speeches by then-President George H.W. Bush, including his Inauguration Speech in 1989, two of his more notable speeches about the fall of the Berlin Wall and the Iraq War in 1991, along with all four of his State of the Union addresses from 1989-1992. PBS NewsHour will continue its coverage on the life and legacy of President George H.W. Bush on broadcast, online and on social through the end of this week, including live at 10 a.m. ET on PBS stations nationwide (check local listings for coverage plans) on Wednesday, December 5 for the funeral at Washington National Cathedral and Washington, D.C. departure ceremonies. The special will be anchored by managing editor Judy Woodruff with national correspondent Amna Nawaz reporting from the Cathedral as well as in studio guests. Coverage will extend on NewsHour’s homepage as well as on Facebook, Twitter/Periscope, YouTube, Twitch and Ustream with live streams of events taking place in Texas and D.C. on December 3, 4, and 6. As markets will be closed on Wednesday, December 5 for a national day of mourning in honor of President Bush, FBN will follow its regularly scheduled programming and present live coverage of the President’s funeral at the Washington National Cathedral. Contributions to the coverage throughout the day will also be provided by FBN’s Hillary Vaughn and Edward Lawrence who will be stationed at the Washington National Cathedral. On Thursday, Varney will again provide the latest on the funeral services in Houston, Texas, and the live coverage will continue with anchor Neil Cavuto during Cavuto Coast to Coast. Hilary Vaughn will report live from Houston throughout the day. David Westin will host special coverage starting at 10 a.m. ET from Bloomberg’s Washington Bureau. 9 a.m.– CNBC Special Report: The Funeral of President George H.W. Bush – anchored by CNBC’s Carl Quintanilla and Kelly Evans from Washington, D.C. The network will also have reporters throughout Washington, DC covering the funeral including John Harwood, Eamon Javers, Ylan Mui and Diana Olick. CNBC.com will also stream the funeral service. CNN will live stream the George H.W. Bush funeral service, without requiring log–in to a cable provider, on Wednesday, December 5 from 10 a.m. – 2 p.m. ET.